You need admin rights on a Facebook group where you want to live stream your pre recorded videos via OneStream. 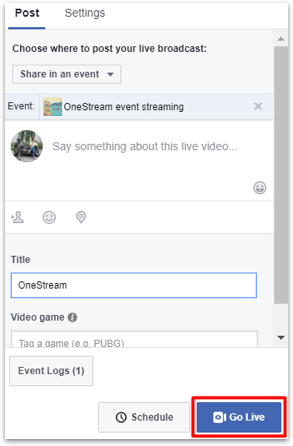 When you have admin rights you can connect the group with OneStream and schedule streams on it. 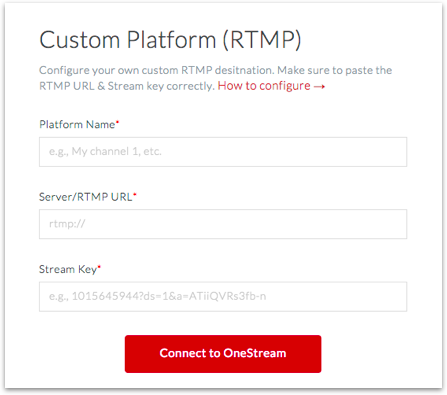 However if you are only a group member, the only way to live stream on the group is by using custom RTMP streaming. Visit https://www.facebook.com/live/create and click "Create Live Stream"
Select Share in a group from right side, under Post tab. Type the group name and title of your stream. Copy Server URL to Server/RTMP URL and Persistent Stream Key to Stream Key on OneStream custom RTMP social account settings. After you have scheduled a video for this RTMP social account come back to https://www.facebook.com/live/create. Once you see your stream playing click Go Live to send the stream to your group. It is very important to understand that you have to click Go Live yourself for the video to be actually sent as live stream in the selected group. Just scheduling it from OneStream dashboard will not send it as live in the group. 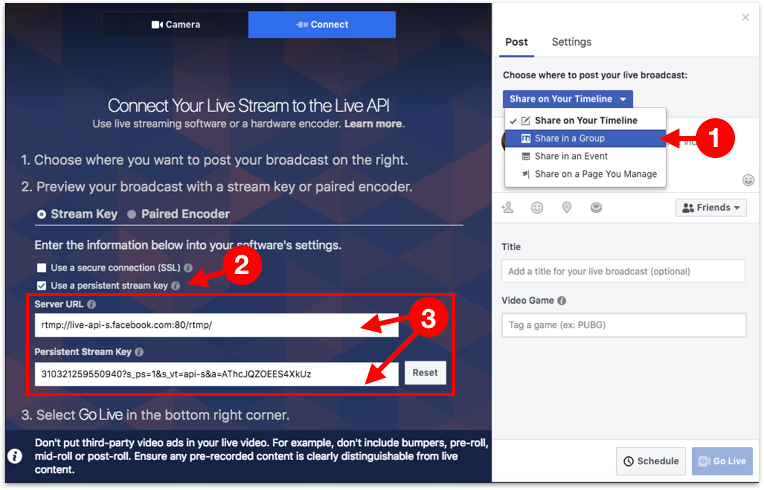 Always follow Facebook live streaming guidelines when streaming with custom RTMP link. We cannot adjust your video when you use custom RTMP so you must make sure your video complies with Facebook requirements.